The New School for… Basketball? 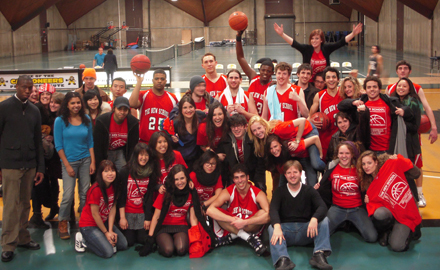 The New School Basketball Team and fans after win at Pratt. In the few years since Michael McQuarrie took the helm as the university’s director of Recreation and Intramural Sports, he’s seen the secret athletic ambitions of New School students emerge. Take the Basketball team. Established as a co-ed YMCA recreational team, the New School team now boasts a cross-divisional roster of talent and a full season of games against competitive men’s club athletic teams from universities across the region. Fresh off a recent win against Pratt Institute, the team is excited by the prospect of moving into a competitive athletic conference. Their current schedule includes a number of opponents from the local conferences that the team may consider joining in the coming years. Truly representative of the breadth of The New School, the team includes players from Parsons The New School for Design, Eugene Lang College The New School for Liberal Arts, and The New School for Jazz and Contemporary Music. They are coached by students from Milano The New School for Management and Urban Policy and the graduate program in International Affairs. Open to any matriculated student at the university, the team was fielded via an open-call tryout. The response, according to McQuarrie, was overwhelming. In the future, players will be limited to NCAA-eligible students. In addition to the Basketball Team, the university recreation office offers a wide array of athletic opportunities to students this semester, ranging from team sports to organized activities like hiking, skiing, and rock climbing. In making decisions about which sports and activities his office offers, McQuarrie says expressed student interests are tantamount. Any students who would like to participate in university athletics and outdoor recreational activities should visit www.newschool.edu/studentservices/recreation.